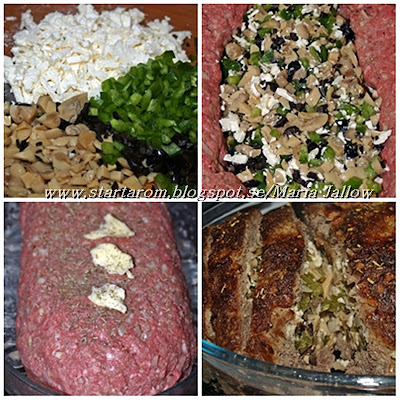 Minced meat is a fantastic type of food wich you can do a lot of different disches of. I put the minced meat in a bowl, in which I also put in the finely chopped onion and garlic (much), salt, black - and white pepper (freshly grounded), eggs, a teaspoon of Physillium Husk and a dash of cream. "I mash" it with my hands, it works best. Then I cut peppers, olives, feta cheese and mushrooms into small pieces. (not minced). Moulds minced meat in a greased baking dish (butter, of course) and make a "cave" in the middle where I put the filling and then molds the minced meat together, so it covers the filling. Put into the oven at 200 degrees Celisus and cook it until the meat juice is clear from colours. You can add some aluminium-foil on the top so the meatloaf not burnes while it cooks al through the meat. Boil Caluliflower and mash it with a potatoe-masher, put some butter, blackpepper, salt, nutmeg and a tablespoon of Creme Fraiche or Philadelphia cheese in to it. What do you do with the left overs? I barely throw any food and got a small piece of meatloaf left...what do to with it? I just sliced it, put it on a oven plate, added some sliced tomatoe, leeks and cheese on the top and put in the oven for 10 minutes. Better than pizza!